Wrought Iron T Hinge from Period Style have all been individually hand forged by skilled blacksmiths using traditional English blacksmithing methods. Such hinges make a traditional finish to cottage doors, barn doors or other period doors. 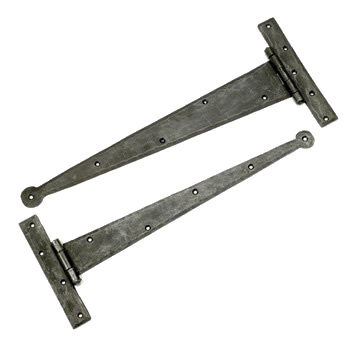 Wrought Iron T Hinges are sold in pairs. Each Wrought Iron T Hinge is individually finished with beeswax. Our Wrought Iron T Hinges are available in several sizes and can be fitted to your cottage door if you order a bespoke cottage door from Period Style.